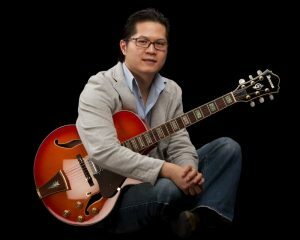 Roger Chong, an award-winning jazz guitarist, composer and educator, was born in Hong Kong and grew up in Toronto, Canada. Formally trained at York University in Toronto, Canada, Chong had the opportunity to study with a list of renowned jazz musicians in the Canadian jazz scene. His mentors included jazz guitarists Roy Patterson and Mike Cado, as well as Time Wrap founder and bassist Al Henderson. The Roger Chong Quartet is known for its live performances - all their albums were recorded live off the floor with minimal takes. It is therefore not a surprise that they have kept themselves busy in the past years with performances at festivals (TD Toronto/Downtown Oakville/Newmarket Jazz Festivals, Toronto Christmas Market) and at intimate music venues (The Rex Hotel Jazz & Blues Bar & Gate 403). Roger Chong has garnered critical acclaim and praise for his work, as showcased in his five self-produced albums thus far. His quartet's latest album, Funkalicious, was nominated for a Toronto Independent Music Award and won a Silver Medal at the Global Music Awards.